I&apos;m @cassolotl, with a focus on environment, sustainability, zero waste, reducing plastic, etc. It's really helpful for grassroots activism! There are flaws with it, but I like it because it just informs and you can ignore it if you want. I don’t know how likely this future is, but I’m 100% into it. It’s about how a self-driving electric car network as a service could replace maintaining and driving your own car. Hey, would anyone be interested in signing my #petition to Colgate to get #plasticfree #zerowaste toothpaste from a mainstream brand? It’s really easy to put things in jars so I think it’s doable! throwback to when I found out where the "I will protect it" meme came from and it's from the NYC parks department about trees! I&apos;ve been trying to restock my Pratchetts second-hand, and there was one stall that had TEN for £2 each, I&apos;m IN. My lunch from a local café, in tubs. Spring onions from a homegrown veg stall, and an olive loaf and cinnamon roll treat from the sourdough bakers&apos; stall. Some things with packaging: guacamole (plastic), hippie deodorant (plastic and glass), and aubergine goop (glass jar, metal lid). It's about language and #Mastodon branding. It is possible to recycle toothbrushes and toothpaste tubes and floss containers in the UK! I want to live in a way that&apos;s healthier for both me and the planet. Less waste, more buying from local businesses and farmer&apos;s market type things, going vegetarian, etc. But I&apos;m struggling with the ways that pushes against my executive functioning difficulties. And at the same time, I&apos;m kind of a mess right now and just dealing with that takes a ton of energy, cleaning up any part of my life to do better seems daunting. "Gove urged to follow Europe with ban on single-use plastic"
"The restrictions on “single-use” plastic will be launched on Monday by the European commission as part of its plan to ensure that 55% of all plastic is recycled by 2030. About 80-85% of all litter in the oceans is plastic, and half of that is made up of throw-away items such as plastic straws." This would be some large-scale change and I am very much in favour! 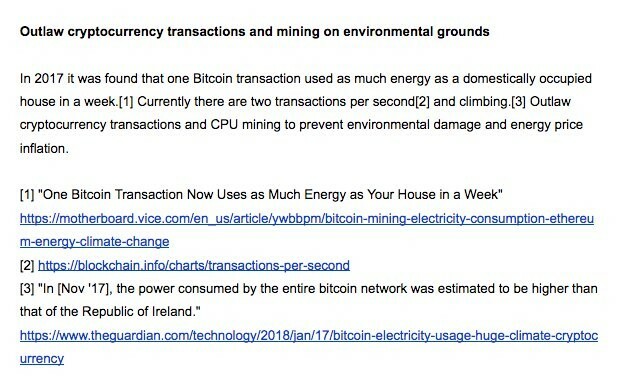 I'm thinking of starting a petition on the UK Parliament website calling for them to outlaw cryptocurrency mining and transactions on environmental grounds. 🤔 Good idea? Bad idea? Thoughts and advice welcome!